The Highest Grossing Entertainment Event In History Was A? Carl Sagan Hailed Which Time Travel Movie As The Most Accurate? When we talk about the profitability of entertainment events, we often talk of figures in the millions, like an action film taking in a few hundred million at the box office. Sometimes we talk about rare blockbusters that pull in a billion or two, but how about 5.6 billion dollars? 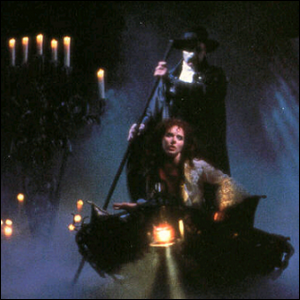 That’s the estimated worldwide gross receipts for Andrew Lloyd Webber’s 1986 smash hit musical The Phantom of the Opera. The play, based on the French novel Le Fantôme de l’Opéra by Gaston Leroux, opened in London’s West End, quickly moved across the Atlantic to Broadway in 1988, and has been there ever since (the play was performed for the 10,000th time on Broadway in February of 2012). In addition to the lengthy run on Broadway, it has been performed all over the world. It is estimated that over 130 million people have seen the production in 145 cities across 27 countries.